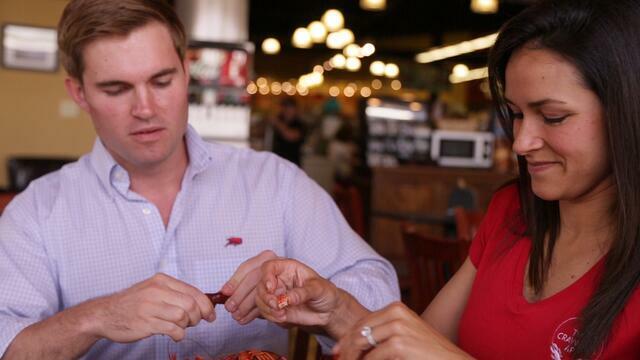 LSU alums Ryan King (2012 BACH ENGR) and his wife, Laney (2005 BACH BUS, 2010 MBA), have developed a cell phone app to make it easier for you to eat crawfish. “The idea came to us three years ago. At the time, we were having crawfish boils just about every weekend, and it took a lot of time to call all the vendors, to figure out who had crawfish and how much they were,” said Ryan King, co-founder of the Crawfish App, and a third-year law student at the Paul M. Hebert Law Center. The app is free for the user and the vendors. “Eventually we’re going to make money off advertising on the app. So, the more downloads we have the more appealing it is for advertisers,” Laney explained. The app allows users to search for live or boiled crawfish based on price, reviews, and location. And not just southeastern vendors listed on the app – there are vendors from Illinois, Tennessee, New York, Las Vegas and Los Angeles. “Our goal is to have every single vendor on the app,” Ryan said. The Kings update the prices every week, calling the more than 900 vendors every Thursday. “Because that’s when we have been told they update their prices for the weekend. And we want users to have the most updated prices,” Laney said. The invention competed in LSU’s sixth annual Venture Challenge, which showcases student entrepreneurs and provides their businesses with capital and resources. The Crawfish App placed second and was awarded $6,000.